Free high-speed Internet access. 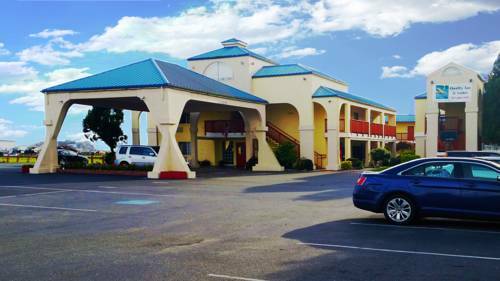 Hotel is located at the gateway to the redwood forest and offers large rooms, some with partial ocean views. Many of the rooms and suites have a balcony and a large whirlpool bath. 100 percent non-smoking hotel. Amenities include in-room coffee service, 25-inch TV, microwave, refrigerator, ironing board, iron, clock radio, hair dryer, cable and HBO. Hotel is away from the highway and has access to the beach and harbor within 500 feet. Handicap accessible rooms with roll-in showers. Every morning deluxe continental breakfast is provided. Many restaurants are within walking distance. Only three miles to the Elk Valley Casino. Pet Fee: 15.00 USD per pet per stay. Pet Limit: 2 pets per room. Pets Allowed in designated room types only. ~65 miles from Crescent City. A genuine rain forest shelters a collection of 23 primordial creature statues spread along a trail. It's been here since 1955. ~60 miles from Crescent City.